Looking for a hands-on adventure in a majestic winter setting? Let Alpine Adventures take you on a dog sledding excursion that the whole family will enjoy. Plus, you can meet and greet your adorable team of dogs! Their tagsled tour is a great way for the family to experience the Alaskan lifestyle of a musher! You and your guide will be pulled by 8-12 dogs through the beautiful winter scenery and snow-covered meadows, surrounded by some of the tallest mountains in Colorado. As you get on the trails, the guide will give you the opportunity to drive, ride and control a larger team! With a completely dog powered sled, it is a peaceful, relaxing way to spend an afternoon. This is a GRAND opportunity to add some excitement to your vacation while making memories that will last a lifetime. Transportation is included with these activities if you book ahead of time. So, bundle up for the ride of your life time! For more information about this activity or any other please use the inquiry form below! Feeling adventurous? Try snowmobiling with Colorado’s highest snowmobiling company, with miles of terrain and views of 14,000 foot mountains. The two-hour Prospector Tour is great for families with kids aged four and up. For those seeking more of a thrill, try the single-rider Performance Tour. You could also try the five-hour Snowmobile/Zipline tour combination! Two hours of snowmobiling followed by another two hours of ziplining with lunch included! 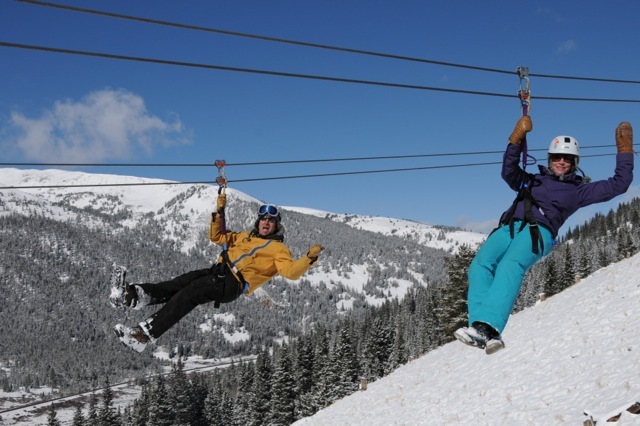 The zipline tour starts 1,000 feet above the base and offers incredible, breath-taking views. On this tour, you will ride six lines, all 400-850 feet in length. In November, the countdown to Breckenridge Ski Resort’s opening day officially begins. Even though it’s the offseason, there is still plenty to do in the mountains. Late fall is the perfect time for horseback riding with the wranglers at the Platte Ranch Riding Stables! The Platte Ranch is the only open ranch riding in the area that operates year-round; it’s located just 45 minutes south of Breckenridge, right outside the historic town of Fairplay. Spread over vast, open acres, the ranch features varying terrain that winds through pine forests, breathtaking aspen groves and exciting river crossings. Travel over the South Platte River while surrounded by majestic mountain views from the Mosquito Range to Pikes Peak. Best of all, this is not a boring nose-to-tail ride. You will be on a real working ranch, experiencing some of their everyday activities, such as checking cattle, riding fence and possibly herding cattle to different pastures. The ranch specializes in small groups (maximum of eight riders) and caters to all levels of riding ability. Youngsters aged four to six can even ride double with an adult. Peaceful and private, the Platte Ranch allows riders to explore over 8,000 acres at their own pace and riding ability. Throughout November, the Platte Ranch will be offering a daily two-hour ride at 11 a.m. 24-hour notice is required for all reservations and all rides are subject to weather conditions. Call or visit the Activities Desk to book your ride! Explore the winter wonderland on an exhilarating 5 hour combo trip with zip lining, snowmobiling and lunch! These tours are at 9am with transportation available at 7:45am for no additional cost. You will be presented with breath-taking views of the continental divide, snow capped mountains, open meadows, and fun, forested areas. Most machines have heated grips and seats, but make sure to dress warmly (ski clothes are great), bring sunglasses or goggles, and don’t forget your neck gaiter/scarf and mittens! On your zipline adventure, you will zip from 5 different platforms. Each line is a dual line, which means you can zip holding hands with your sweetie or another family member! Dress warmly since you will have the exhilarating winter winds on your face as you zip over railroad tracks, a stream, and the breath-taking Colorado snow-covered forests! If it gets too chilly, warm up with hot chocolate at their toasty yurt. Original price: $410/Driver and adult passenger OR $375/Driver and child Passenger (7-12yrs), but contact your Activities Coordinators for owner discounts and more information at activities@breckenridgegrandvacations.com.